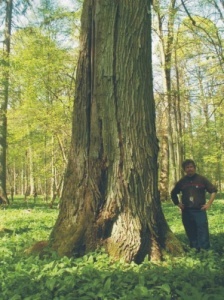 Elm belongs to rare tree species in the Bialowieza Forest. There are three elm species occuring in Poland and most frequent is the Wych Elm- also called the Scotch Elm. The other two are: the Field Elm & the European White Elm. All three species are typical of moist, fertile habitats but it happens that individual elms grow in fresh forests. In the Bialowieza Forest, alike in the whole world, elms are decimated by so called the Dutch elm disease', in other words: graphiosa(the name comes from fungus causing the disease- graphium ulmi). Once in the Bialowieza National Park there used to grow the Wych Elms with trunk perimeter reaching 500cm. Nowadays the thickest elms have perimeters of 450cm and their maximum height is 33-34 meters(in some sources the height of 37m is given). 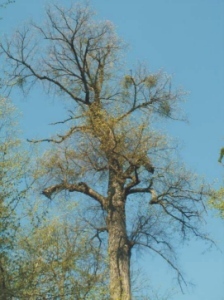 Field elms & European elms do not exceed 280cm in trunk perimeter and 30 meters in height. Alder occurs mainly in alder-ash riparian forests & alder groves where it forms singlespecies forest. Particularly admired are soaring alder trunks ended with a small crown. According to some sources the Bialowieza alders grow up to 40 meters in height with trunk perimeter( at the height of 130cm) exceeding 300cm. It is difficult for me to take a stance on the information concerning the trunk perimeter of Bialowieza alders but it seems to me that the height given is a bit overstated. 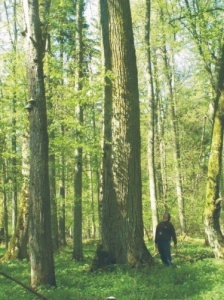 Białowieza maples are enormous trees. Especially their trunks densely covered with moss catch everybody's eyes. They grow mainly in fresh forests. The heights of maples' trunk pillars reach 20 meters and the total tree height might be even 37m. I measured myself one of maples growing in the National Park. Its height was 37m with the trunk perimeter(at the height of 130cm) reaching 380cm what confirms the information included in literature applying to this subject. Crowns of the Bialowieza maples look extremely beautiful in spring when their yellow and green colours sparkle in the sun. Crowns of the Bialowieza hornbeams form a characteristic roof of the forest. 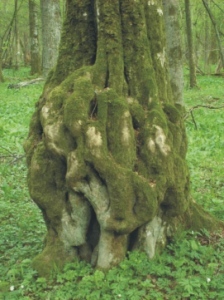 Regarding habit the hornbeam is the most diverse Bialowieza tree. Crowns & trunks of the local hornbeams take on extraordinary shapes As for size hornbeams are no match for other trees. It sometimes happens that in the Bialowieza Forest hornbeams reach 30 meters in height with the trunk perimeter(at the height of 130cm) of 300cm. Aspen is one of two specimen of poplar type in the forest flora. According to literature the biggest aspens grow up even to 40 meters and reach 300cm in the trunk perimeter(at the height of 130cm) with the age of 180 years. In the Bialowieza Forest there occur 4 birch species: silver birch, downy birch, betula humilis schrank and carpatia. The silver birch reaches the biggest sizes: up to 30 meters high and about 300cm in trunk perimeter; a bit smaller is the downy birch: up to 30 m high and about 230cm in trunk perimeter(at the height of 130cm). In the Bialowieza Forest there are 15 willow species but none of them reaches monumental sizes and they occur mainly in the forest rivers valleys. Firs occur only in Belarussian part of the Bialowieza Forest-in the natural reserves: Cisówka and Hubar. Most scientists assume that those positions are of natural origin. At present wild Yews do not occur in the Bialowieza Forest. Once Yews used to have their own position in the natural reserve Nieznanowo, where towards the end of XIX century there grew two small bushes. After the World War I searching for Yew in the area of Nieznanowo was not successful.